I think I’ve mentioned before that television is an important form of entertainment in the Boomer household. We were happy customers of Cox cable for decades. When they added broadband internet we were early adopters and continued to be happy as technology progressed and we got DVRs and high definition television (and channels to support it). Then we moved only 21 miles away in the same county. Naively, I called Cox, just as I called San Diego Gas & Electric, to order a move for our services. The customer service representative delivered the bad news…our new home was serviced by another cable company. We were a little put out to lose our longtime email addresses, but otherwise thought it would be okay. Two years later, I can tell you it was not okay. We like to watch regular shows from the DVR so we can view when it is convenient and fast forward through commercials. Over and over again, we sit down to watch a show and it’s unwatchable due to the video and sound pixilating and freezing. The DVR/receiver has been replaced and then rebooted over and over again. This frustration has lead up to look for alternatives. 1. Cable. A logical option would be to change cable companies. Naturally, that path is not available due to the city giving the cable company who shall not be named a monopoly in this part of time. A mile away my old cable provider is the sole cable provider. 2. Satellite. My family in the Midwest have used satellite service for years so we turned to them for advice. They have tried both of the major competitors and DISH was the clear winner. After procrastinating for too long, Mr. Boomer and I called them to come out and see if it would work for us. Unfortunately, our townhome blocks the view to the South — so it was a no go. Additionally, we misunderstood that new cabling would have be laid throughout the home and would like to avoid this if possible. 3. U-Verse. Our only other option at this time is the new service by AT&T. U-Verse was not available in our neighborhood until recently. It will be about a $20 increase per month but offers more features and the NFL channel (imagine that!). Mr. Boomer will be researching the cabling issue with and we’ll have to talk about the pros and cons. As I talk to co-workers I find we’re not alone in the search for better service. 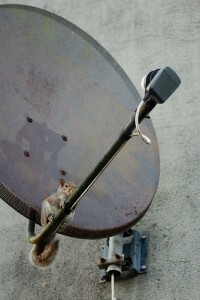 Are you happy with your television service provider? I admire your restraint in NOT naming Time Warner as the culprit in such incredibly bad service, but I think they deserve to be “outed” publicly. Just as companies tout when they get good reviews, we as consumers should ensure that they – and other consumers – are equally aware when they provide bad service. That said, I hope you called Time Warner – repeatedly – to complain. Besides letting them know there’s a problem it can reap financial rewards for you in credits to your account for DVR rental and/or poor cable service. Small consolation when you miss an episode of House, Modern Family, or The Biggest Loser, but some days we have to take what we can get. You’re right Kevin; I should have named them. It’s not too hard for someone to figure out!. Thanks for commeting. Previous post: Did the Ice Cream Shrink?